Aim: Is He A Fire Starter? "Haborym (aka Aym) is a fire demon and a duke of hell, who commands 26 legions. 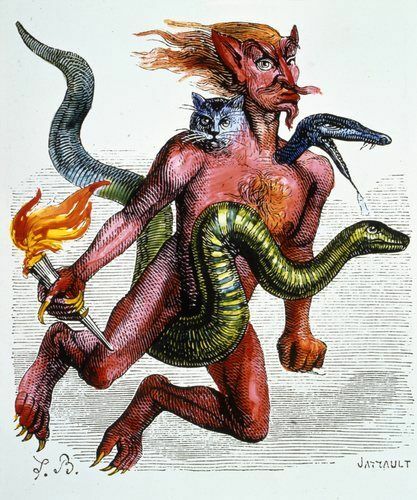 He appears holding a torch and riding a viper and he has three heads; a serpent, a man, and a cat." That has been the opinion of magicians throughout the ages, that Aim (or Haborym) is a fire starter; that where ever he goes, things burn. The old drawing of Aim shows him as a complex character that is said to be always carrying an eternal flame in one hand as he moves about. A more contemporary description has uncovered something interesting about this spirit that the ancients apparently missed. Aim appears to be a three-headed entity with a lot of energy radiating from it. But there did not seem to be fire. Instead it appears to be lights emerging from each of the heads. To the ancients the light may have appeared to be fire, and it may even cause fire, but it is not an eternal flame carried in the hands of Aim. It comes from the core of the entity. The heads and body of Aim do not match the description given by the old magicians either. Most of the body appears to be that of a coiled serpent attached to the serpent head on the left. The head on the right is an odd creation that does not look to me like a cat. It is clearly alien in its origin. Notice the large cavity with what look like fangs at the end of the serpent. From all appearances, Aim is a deadly creature. If his mission is not to burn, it will be something equally as bad.